CHICAGO (CNS) — U.S. bishops sent their immediate past president to Vietnam to see how they could help with the first college-level Catholic school approved in the Asian country in about 40 years. 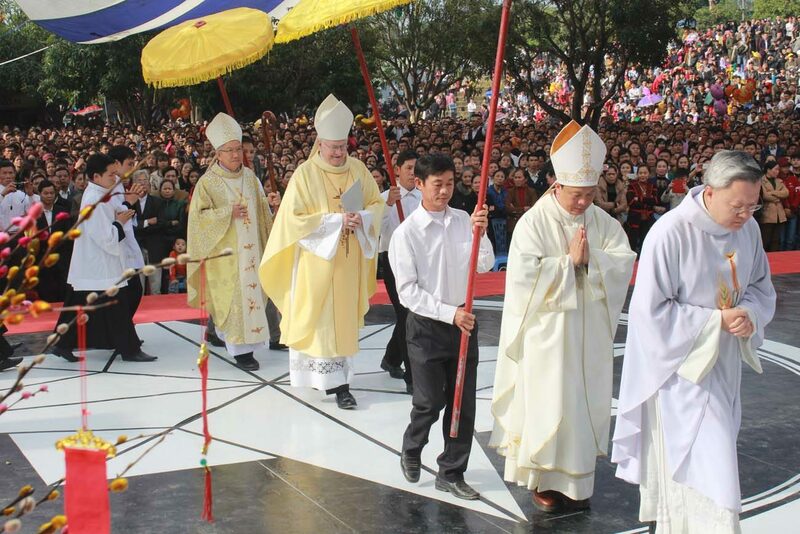 “The church in Vietnam has suffered … hardships and … religious repression, and slowly over these 40 years there are some headways that have been made,” the archbishop told Catholic News Service Feb. 2. He said as part of the visit, the U.S. Conference of Catholic Bishops wanted to know how it could help the brand new Catholic Institute of Vietnam. Archbishop Kurtz said the church in Vietnam is looking for support to help build the institute’s library, create programs that would have students come to the U.S. to learn English, and help for starting a visiting professor program. Under French rule from the late 1800s through 1975, the country had a strong Catholic presence, and the church was an influential force. But in 1975, when the communists took power after the Vietnam War, the government tightened control over religion and religious institutions. Catholics were harassed, arrested and detained as part of government crackdowns. In the first two decades under communism, hundreds of thousands of southern Vietnamese fled and an estimated 350,000 sought asylum in the U.S. The bishops’ conference website says there were nearly 500,000 Catholic Vietnamese-Americans in 2013. In the early 1990s, as Vietnam opened up trade with other countries and relations with the United States started to normalize, Vietnam’s government got less involved in church affairs. There are still reports of sporadic crackdowns in different parts of the country. While the government is not involved in the church hierarchy, government approval is still required for numerous activities ranging from building churches in certain areas to doing certain church-related work. Substantial portions of land previously owned by the church remain in the hands of the Vietnamese government. “I saw instances where there had been former schools that had been taken over by the government,” said Archbishop Kurtz. “Currently, religious communities are able to conduct kindergarten, but they are not given permission to conduct schools. One of the issues that’s being identified now is the capacity for the church to open up its mission to schools and hospitals,” which he said were a vibrant part of society prior to 1975. During his Jan. 24-30 visit, Archbishop Kurtz visited dioceses in Hanoi, Ho Chi Minh City, Vinh, Hue and Xuan Loc, where he celebrated well-attended Masses, met with the Vietnamese bishops’ conference president, spoke with the U.S. Embassy deputy chief and spent time with Servants of Jesus sisters and some seminarians. Orendain, currently in Chicago, covers Asia and the Philippines for CNS. The Catholic Church can better serve its faith in Vietnam only when historical facts and reality are respected: 1) Vietnamese Catholics were used by French colonialists to portray a nation of “savage culture”, group of “victimized religion” and turn them into collaborators with the invaders. 2) Trying to save whatever remnants of French colonial power, post-war in 1954 – American and French governments once again deployed the Catholic card to migrate 750,000 northern people to the south. 3) The Vietnamese Catholic Church again, became the pillar of authoritarian regime, led by Ngo Dinh Diem who not only promoted Catholics but repressed other religions. 4) No surprise when the Communist victors with history-based viewpoints and national unity policies apply skeptical and often adversarial approaches in their governance. Although more relented due to overall societal progresses, Vietnamese government can’t afford to dismiss the active anti-Vietnam roles played by Vietnamese Americans and indirect political encouragement by the American Catholic Church as well as the Vatican. 5) Long-ranged growth of Vietnamese Catholics (2nd largest in Asia by density) depends on sensible leadership guidance, including in-flow financials from overseas and management of rogue priests/instigators inside the country.